Prepared in October 2013 as part of the High Water Line | Miami project/movement, the video below depicts sea level rise in greater metropolitan Miami at one-foot intervals, ranging from one foot to ten feet (in the introductory section at the beginning) and one foot to six feet (throughout the remaining sections). 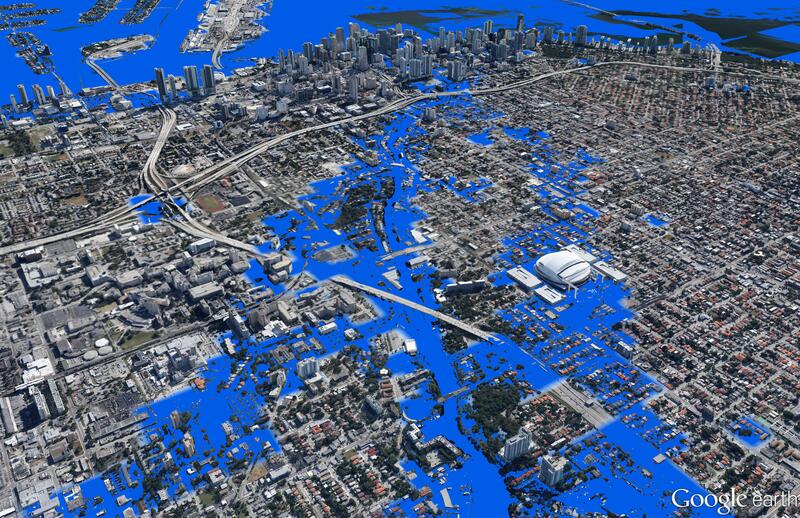 Simulated Sea Level Rise in Miami. Data Source: Climate Central. Map Source: Matthew Toro. 2013. The raw sea level geospatial datasets were produced by Climate Central and shared with High Water Line | Miami. To learn more, please visit Climate Central’s “Surging Seas” sea level rise analysis mapping tool.